In my last post, I wrote about Oklahoma’s low per pupil spending rate when compared to other states and argued against the old conservative claim that the state’s low cost of living means schools here are actually funded adequately. Another conservative argument, especially in relation to the recent and no doubt future tax-cut proposals, is that we, in the words of Gov. Mary Fallin, need to “right-size government.” The claim assumes that state government here is bloated, a common conservative complaint, which is not based on empirical evidence. The anti-government rhetoric here is more often than not met with stoic silence by state workers, many of whom are paid low salaries and do some of society’s most challenging jobs, such as guarding prison inmates or helping abused children. But the “right-size” mantra is political sloganeering. 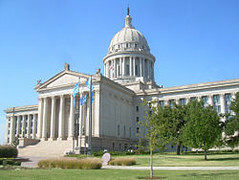 The reality is that Oklahoma government has shrunk considerably in recent years, calling into question whether the state can offer adequate services and function effectively. In a recent blog post, David Blatt, director of the Oklahoma Policy Institute, a Tulsa-based think tank, shows that the number of state workers has dropped from fiscal year 2009 by 3,804 or 9.8 percent. Going back even more years, the number of state workers has dropped by 1,633 or 4.4 percent since 2001 while the state’s population has grown by 330,000, Blatt points out.
. . . overall, the sharp drop in state employment shows the deep strains created by the state fiscal crisis of recent years. With positions being eliminated and vacancies remaining unfilled, fewer state employees are left to shoulder greater responsibilities. This can have serious consequences for the Oklahomans whose safety, health and welfare it is the mission of public employees to promote and protect. Blatt’s research speaks for itself, and I encourage everyone to read his post, but I want to address the issue from a more personal standpoint. I’m friends with a number of state workers, who continue to do their jobs with professionalism and integrity despite knowing that any type of substantial raise or benefit increase is unlikely for them in the immediate future. For some of them, even the most cynical, it’s because they have been called in some way to help the less fortunate people in our culture or have dedicated their lives to service. Many of these state workers have demanding jobs and their terms and conditions of employment are now controlled by people openly hostile to even the concept of government or at least dedicated to cutting government at whatever cost. That this creates a morale problem for state workers is a given, but an even deeper issue is whether the quality of life here, despite political cheerleading, is actually in a serious decline. Fewer state workers and fewer teachers as the population grows substantially and school enrollment goes up means that eventually something has to give. The idea that the state can somehow prosper in this environment is only wishful thinking or a political campaign trope. Let me be clear: Overall, the state needs more state workers and more teachers, and they should be paid adequately, provided with decent benefits and given regular raises.